Photo Album A great collection of pictures - mostly Cycle Oregon related at this time. Take a look and then feel free to add some of your own favorites. Lists and Articles The Big List, Gearing 101 Tutorial, etc. A reference collection of cycling-related information. 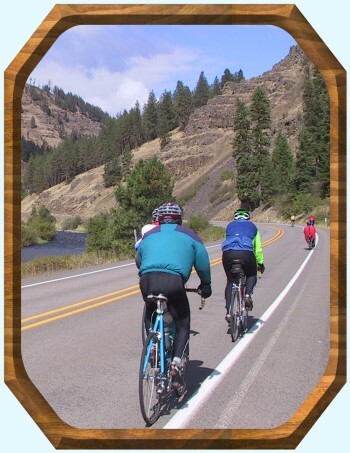 Cycle Oregon at a Glance Photo Journals. Informative collections of pictures showing life in camp and on the road with Cycle Oregon. Cycle Oregon Collected Wisdom An edited and sorted collection of postings from veteran Cycle Oregon riders giving details and advice about every facet of Cycle Oregon. Cycle Oregon History Information about previous Cycle Oregons. Bike Rides Rider's opinions and stories of many Oregon and Washington bike rides. Stories and Humor A collection of postings about cycling. Guest Book Your place to respond! After you have had a chance to look around please give us some feedback about this website and what else you would like to see. The CyclingSite is a privately owned website devoted to our passion for cycling. Much of the content is related to Cycle Oregon, but we have no affiliation to them. We are enthusiastic fans of the ride. The Big List A comprehensive list of everything you might wish to take on Cycle Oregon. The Minima-list A list showing a minimalist approach to Cycle Oregon packing. Packing Multi-day bike tour packing. Training How to train for a multi-day bike tour. Ride Calendar Rides in the Pacific Northwest. Cycle Oregon Statistics Where and when and how far and how high...! Cycle Oregon Locations A list showing where and when Cycle Oregon visited. Gearing 101 Tutorial If you are thinking of changing your bicycle gearing, or simply want to understand it better, this is a good resource. Weatherized Camping and Cycling Some guidelines on what equipment and clothing will help you to enjoy the weather. Copyright 2004, Artist's Touch or by original content developer.